the time has finally come for the big reveal of the send something good packages! leading this project with gentri and kristy has been so much fun for me. i loved the challenge of creating a seamless list of participants and matching them up with people in different states or different parts of the world. send something good has really become like my baby throughout the past two months. 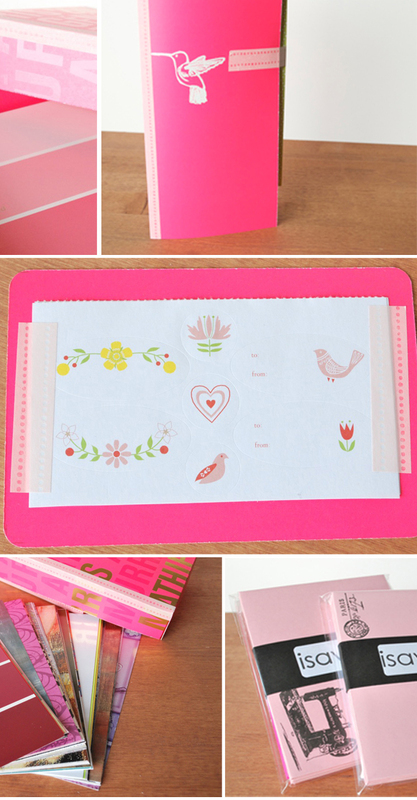 thank-you to everyone who supported my stationery shoppe by purchasing send something good products (by the way, i'm currently having 25% off sale and there are some ssg items left over!) and truly - thank-you to everyone who participated in this project. it was such a pleasure to meet so many amazing and passionate young women. 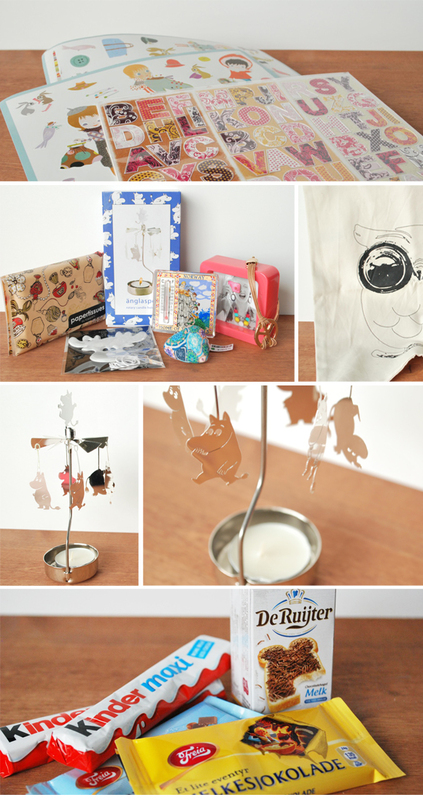 below are images of the package i sent to katie of lemon jitters. katie lives in colorado and we have a lot in common. so not only was it fun to pick out goodies for her, it was easy too! i sent stickers, collage/scrap papers, a notebook, make your own watercolour cards, my stationery, fold and mailers and a handmade mint green basket! you're wonderful katie and you deserved all of it and more! i received an awesome parcel from mariaana (let the time roll by) in norway. i was nervous because although it was beautifully wrapped, it had gotten a little roughed up on its journey! but amazingly - everything inside was in perfect condition!! and by everything i mean...there was a lot of stuff in there! she included chocolates, european delights, a photograph, postcards, stickers, note cards, a unique candle, picture frame, bracelet, keychain and more! i loved the little notes she included and the mix cd she sent me was wonderful :) thanks mariaana! I'm glad to hear everything arrived in one piece, I was a bit worried about the picture frame :) Did you get a chance to read the book? thank-you again for your amazing parcel mariaana!!! "to die for" wow thanks! i was thinking i could have done a little better but it is fun how the bright pink and the turquoise green look so nice together in the images! wonderful packages - it is a treat to see them! I didn't have time to take part in this but perhaps next time ... so much fun! i hope you do participate next time! send an email to sendsomethinggood2012@gmail.com and let us know you are interested and we'll notify you when the next round happens! Thank you so much for putting this all together with Kristy and Gentri! It has been so much fun! no thank YOU for participating sam! Kaitlyn.. thank you SO much for organizing such an awesome blogland event. You did an absolutely fabulous job. It was so much fun to get to know so many fellow bloggers and get back in touch with that glorious thing called the mail. Can't wait for next time! oh my gosh you are too sweet lena! gentri told me you were awesome and you totally are! and i totally agree - mail is GLORIOUS!! This is such a cute swap! Love your packaging! my oh my whatta package you sent your secret pal!! loveeee the colors of it all and the stickers are uhhmaze!! glad to see you got candy from Norway! I definitely don't discriminate with candy so it'd be a delight!! thanks for leading this project... it was so much fun! Thanks so much for helping put this together! This was so fun! You totally spoiled me, Kaitlyn! Your sweet comment, "You're wonderful..." just made me feel all warm and fuzzy! Kaitlyn! I'm getting so much positive feedback on my Send Something Good reveal post! Girls are asking when the next one will be! yay! so glad to hear it! tell them to email sendsomethinggood2012@gmail.com. we're keeping a file of those interested in the next round so we'll send out a notification when it happens again! Looks like you were spoiled just like me with your package :) Lovely items you sent out as well, headed to check out your shop now! i am loving that candle that she sent over! What a great project! I'm sad that I've missed it, but it looks like it was a wonderful success. How fun! Thank you Joy! & I had fun pulling this together for Jackie, I feel like my wrapping actually turned out how I wanted!